Jr. and Sr. 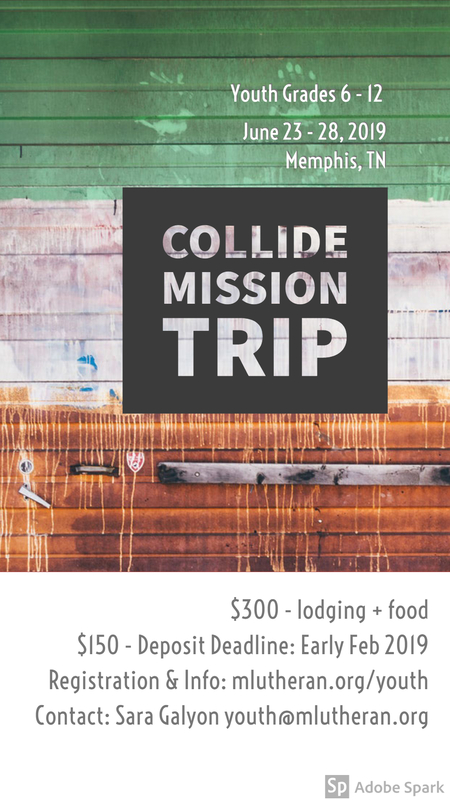 Youth are invited to attend our summer mission trip experience this summer through Collide in Memphis, TN. The dates are June 23-28, and the cost is $300. A deposit of $150 per student is due January 15 for those wishing to attend. Collide is a unique week for youth and adults to enter into theological discovery, discussion, and reflection. By immersing participants in experiences outside of their everyday context, Collide helps move youth and adults towards a more robust faith and better understanding of God, themselves, and others.